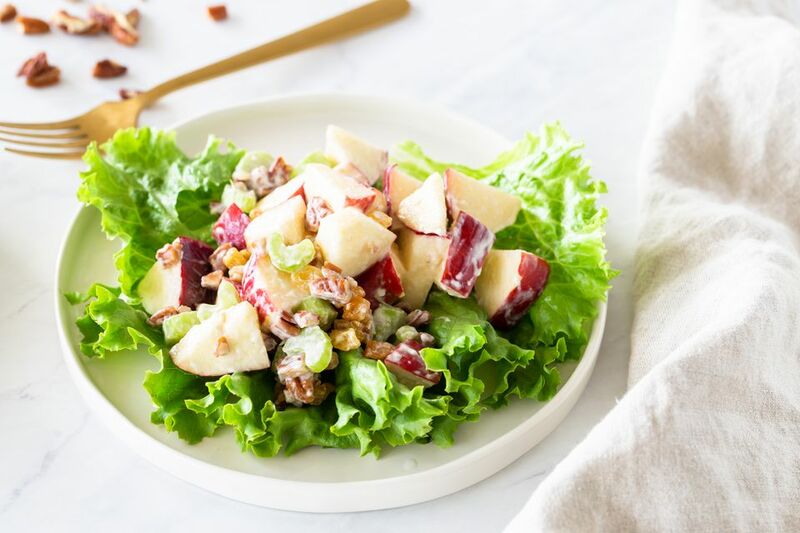 This deliciously fresh apple salad is similar to the famous Waldorf salad, a classic fruit salad made with apples, celery, and mayonnaise, which dates back to the late 1800s. The addition of nuts didn't occur until 1928, and the Waldorf salad is now known to feature grapes and walnuts. In this recipe, pecans are used instead of walnuts, and raisins are added in place of the grapes, maintaining the salad's general taste and texture profile but changing it up a little bit. What results is a refreshing but creamy dish with a nice crunch—perfect for lunch or even a late-day snack. For the holidays, you can incorporate dried cranberries in the salad to give it a festive touch. Wash apples, but do not peel them. Core the apples and cut into 1/2-inch cubes. Sprinkle with lemon juice to prevent discoloration. In a large bowl, combine apples with celery, pecans, raisins, and mayonnaise and gently mix. Serve scoops of apple salad on lettuce leaves. Fresh pecans work nicely in this dish, but to bring out their flavor, even more, toast them first. Place the nuts on a baking sheet coated lightly with cooking spray and bake at 350 F for about 5 minutes—watch carefully as the pecans can burn easily. As with Waldorf salad, this apple salad also benefits from the addition of chicken and turkey, or even canned tuna, making it a more filling dish and perhaps even a sandwich filling (it is great stuffed inside a pita pocket). You can also play around with the apple variety, using what is in season or combining two different types—just be sure it is a crisp apple and not one with a softer, more mealy flesh. Ideal varieties are Granny Smith, Pink Ladies, Golden Delicious, and McIntosh. If you would like to lighten up this recipe, you can replace some of the mayonnaise with plain yogurt. It will add a little bit of tang to the dish so you should be conservative when squeezing the lemon juice, only using as much as needed to keep the apples from browning. You can also use a reduced-fat or fat-free mayonnaise if you prefer.